Now that you have the basic details, let's examine them both, as well as the intangibles that really don't have a category in a table. Size - This is the Stowaway's biggest advantage over the GoType. When the Stowaway is open, it is wider than the GoType. This is good because the keyboard isn't too tiny; users with large hands may find the GoType a little hard to type on comfortably. When you aren't using the Stowaway, it folds down to nearly the size of the Visor, making the Stowaway great for traveling when you don't want a lot of bulk. Layout - Here the Stowaway wins again. 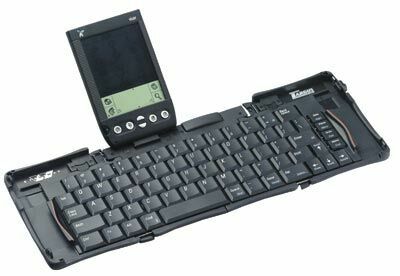 Because of its wider keyboard, the keys are standard size and are extremely comfortable to use when typing. The GoType's keys are not as high vertically, so they can be tough on big fingers and can cause your hands to cramp sooner. Key Spacing/Travel - Here the difference is more of a grey area. If you have small fingers, you will probably prefer the GoType. For others, the Stowaway will be less cramped and feel just like a normal keyboard. Overall, the Stowaway feels more comfortable to type on. Weight - The Stowaway is lighter than the GoType, weighing just over ½ lb, while the GoType weighs 5 oz. more. This makes a difference when you're travelling and carrying your keyboard in a briefcase or backpack. HotSync - Here is where the GoType wins, offering you the capability to HotSync while the Visor is still in the keyboard. You won't be able to use the keyboard and the comm port at the same time, but you also won't need to buy an extra cable for travel. Arrow keys - For me, the Stowaway is the big winner here, as the GoType's arrow key layout goes against any normal keyboard configuration -- the Stowaway uses the standard inverted-T layout, which makes it user friendly. Included Software - This is what makes the GoType a great value, beacuse you don't need to purchase any DOC editors to create large text files. You also get a 200,000+ word thesaurus that integrates with the TakeNote editor. Keyboard driver - This one is close. The GoType lets you map more applications to a function key, but the Stowaway has an index of keyboard shortcuts and uses them more effectively. Read the reviews for specifics on the keyboard drivers. Durability - The Stowaway comes with a thin neoprane that offers some protection. The GoType, although it comes without a case, feels much sturdier because there are fewer moving parts and also has a nice clam shell that closes over the keys as protection. Price/TCO - Here is where the GoType wins hands down. If you include all of the extras that come with the GoType, it is a real bargain compared to the Stowaway. Below is what you get with the GoType and what you would need to purchase to get the same thing with the Stowaway. It should be noted that the shareware Thesaurus that is available has only one-quarter of the words that comes with WordSleuth. With the money saved, you could effectively buy two GoTypes for the price of one full-featured Stowaway. Now the difference isn't as severe if you don't care about a thesaurus or HotSync cable, but judging strictly from a price standpoint, the GoType is the clear winner. 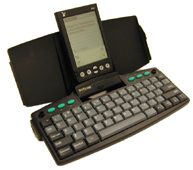 Both the Targus Stowaway keyboard and the Landware GoType! for Visor are great keyboards - your decision will be based mostly on price and how you plan on using your keyboard. If your only concern when shopping for a keyboard is price, the GoType is the obvious choice. The GoType is also better suited for mobile professionals that are going to HotSync on the road and don't want to buy a cable. On the other hand, for those that are concerned with how typing feels when using a keyboard or don't want to lug around anything bulky, the Stowaway is the best choice.